Today at therapy was really hard. I was sitting here crying, and generally being miserable, when I felt a nudge at my knee. I looked down to see that Zeus, my service dog, was doing his job… and brought me a potato. it is very hard to cry with a gift of potato. Remember this? I’m having a rough time right now. Zeus has a solution. 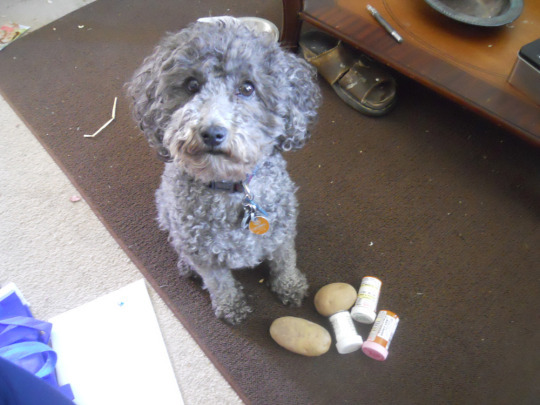 That would be an empty pill bottle, the *correct* pill bottle, a bottle of embossing powder, and two, TWO potatoes. Oh my goodness, what a delightful creature.